- both paintings are first recorded in the copies of 'The St Catherine Altarpiece' made by the Torgau painter Daniel Fritsch, which are dated 1586 and 1596 (now Gotisches Haus, Stiftung Dessau Wörlitz and the Evangelical church (Dorfkirche), Berlin, Alt-Tempelhof, respectively). - according to an inventory taken at Schloss Hartenfels, Torgau, in 1610 there was in the 'Schöne Fürstenkammer' an 'alte gemahlte Taffel von Ölfarben darauff die Historien von der Catharina', described in 1601 merely as a 'grosser Flügelaltar mit vergoldetem Rahmen', which can probably be identified with Cranach's altarpiece. - in 1738 the altarpiece was brought to Dresden from Torgau by the court painter Bonaventura Rossi. It can evidently be identified in the 'Specification derjenigen Bilder, so von Monsieur Rossi von dem Schlosse zu Torgau mit nach Dresden genommen worde' that was drawn up in Torgau on 12 July 1738, as number 2, 'Ein Bild, worauff die Historia der Dorothea auf Holz, in 3 Feldern gemahlt'. - the whole altarpiece is first recorded in the Dresden royal collection from 1786 in records of paintings to be sold; the wing panels had evidently been sawn in two by this date, as inner and outer panels were listed separately. - the two outer wings were sold in 1797 together with one interior wing: the panel with Saint Apollonia (NG6511.1) was sold on 27/8 July for 2 Thaler 8 Groschen, and the Saint Ottilia panel (NG6511.2) on 2 December for 11 Groschen. - all three panels were acquired at an unknown date, probably via the Dresden painter Ferdinand Hartmann (1774-1842), by Heinrich Wilhelm Campe (1771-1862), a Leipzig businessman and collector, and sold on 24 September 1827 in Leipzig. - the National Gallery panels are listed in the sale catalogue as numbers 286 and 287, by Hans Holbein the Elder; number 300, the interior panel depicting Saint Dorothy and her companion, was sold by Hans Baldung Grien. - the latter was acquired by the Leipzig collector Maximilian Speck von Sternburg (1776-1856), and remained in the possession of his descendents until acquired by the Dresden Gemäldegalerie in 1996, where it had been on loan since 1931. - NG6511.1 and NG6511.2 were purchased at the 1827 sale by a Berlin dealer, 'v.d. Laar', perhaps the artist Ferdinand von Laer (active 1828-40), for a total of 50 Taler and 4 Groschen. - by 1875 they were in the collection of the banker and trustee of the National Gallery, Samuel Loyd, 1st Baron Overstone (1796-1883). - they were inherited by his descendants and acquired by the National Gallery from the Loyd Trustees through a private treaty sale in 1987. [Findeisen, Magirius 1976,167]; [Marx 1996, 39]. [Marx, Mössinger, Exhib. Cat Chemnitz 2005, 380, 387, fn. 2]; and [Marx 1996, 40, 60, fn. 35]. Transcript made by Dr Hans Posse in Archiv der Staatlichen Kunstsammlungen, Dresden, Posse Archive, vol. XXII, after documents formerly in the Staatsarchiv Dresden, Cap VII, no. 8, Verschiedene Verzeichnisse von Gemälden, loc. 18212. I am most grateful to Katrin Kolb of the Gemäldegalerie, Dresden, for discussing with me the archival evidence concerning the altarpiece at Dresden in the eighteenth century and providing a copy of relevant parts of her transcript of Dr Posse's notes. Ibid. ; [Posse 1936, 246]; Posse transcript in the archives of the Staatlichen Kunstsammlungen, Dresden, after Staatsarchiv Dresden, Cap VII, no. 25 no. 15, sold on 27/8 July 1797: 'Die heil. Utilia ein Buch inder Hand haltend, worauf zwey Augen liegen, dabei noch eine Heilige' and 'nicht zur Auction übergeben worden'; catalogue no. 88, 'Die Enhauptung der heil. Catherina'; no. 139, 'Die heil. Utilia dabey noch eine Heilige von L. Cranach'; under 'verauctionert' no. 140, 'Die heil. Appollonia, dabey eine Heilige so ein Licht in der Hand halt von L. Cranach 2 Thaler 8 Gr. '; and no. 141, 'Die heil. Agnes ... dabey die hl. Dorothea'. The panel with Ottilia was sold on 2 December for 11 Groschen. Information kindly provided by Dr Dieter Gleisberg: correspondence in NG files. See also [Kolb, Exhib, Cat. Chemnitz 2005, 381, fn. 12] (citing [Gleisberg 2000, 116]). The presence of the Cranach panels in the Campe sale in Leipzig in 1827 was first noted in [Trautscholdt 1957, 244]. Ibid. For Maximilian Speck von Sternburg see further [Gleisberg 1998, 22-40, esp. p. 23] (I am grateful to Katrin Kolb for this reference). 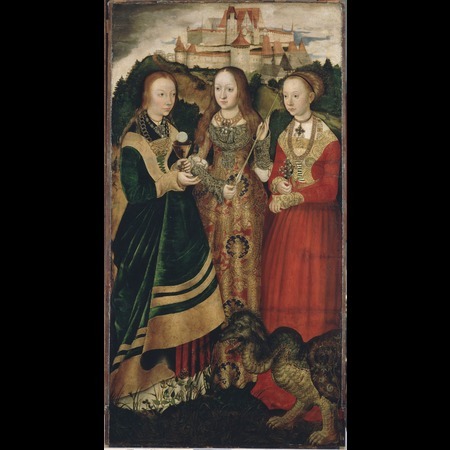 [Susan Foister, 'Lucas Cranach the Elder and workshop, Saints Genevieve and Apollonia and Saints Christina and Ottilia (The St Catherine Altarpiece: Reverses of Shutters)' published online 2015, from 'The German Paintings before 1800', London: forthcoming. 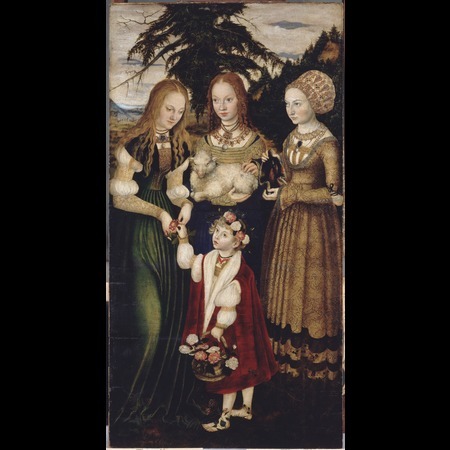 Some scholars have suggested that Cranach was assisted in the making of the altarpiece, and that the National Gallery panels might be the work of assistants. 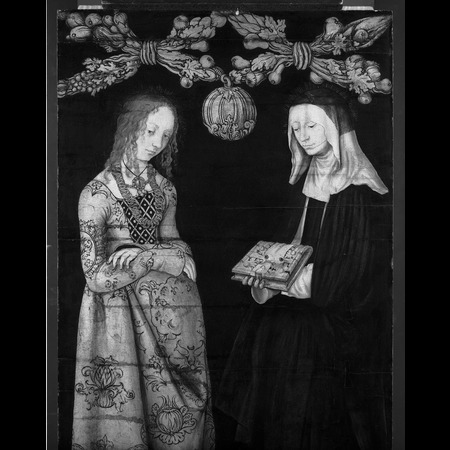 Heydenreich has noted adjustments to Saint Margaret's headdress and argued that this represents Cranach himself correcting the work of an assistant. Cranach employed workshop assistants at the time of the painting of 'The St Catherine altarpiece': in 1505 he paid a 'Christoph Maler' from Munich, as well as an unnamed journeyman. Studies of the techniques of Cranach's paintings have suggested that on occasion the painting of the whole of the exteriors of the shutters of large altarpieces may have been delegated to assistants, and that there are also instances of collaboration on single panels. Christoph may well have assisted in the painting of the National Gallery panels. Schade observed a disparity in quality between the left and right faces of the shutters. There is certainly some compositional disparity: saints Genevieve and Apollonia are placed further away from the viewer and hence higher up the panel than Saints Christina and Ottilia; the feet of the former pair of saints are visible but not those of the latter. The figures of Saints Christina and Ottilia are perhaps painted with slightly more vigour and refinement than Saints Genevieve and Apollonia, although the underdrawing of all four heads is of equally high quality and is probably by Cranach himself. 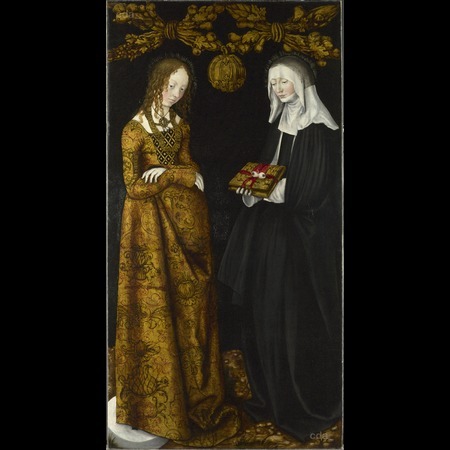 It is conceivable that the shutter with Saints Christina and Ottilia received more attention from Cranach himself than the other, but the differences in quality are not great. 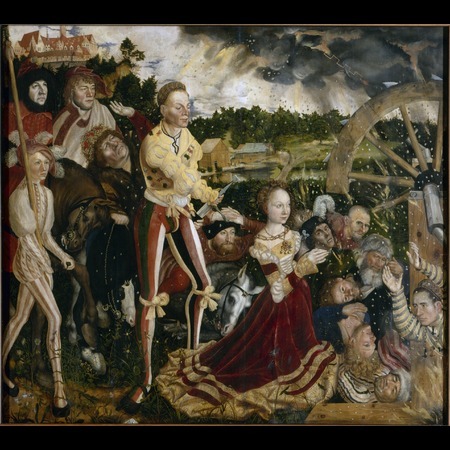 The painting of both National Gallery panels can be plausibly attributed to Cranach himself with workshop assistance. [Schade 1974, 382, fn 266]; [Marx 1996 A, 33] and further comments on the unusally elongated figures and their placing, ibid., p. 34. [Heydenreich 2007 A, 292–3, 308–9]. Ibid. p. 310 and p. 406, document no. 5, September 1505. [Schade 1974, 382, fn 266]; also Schade, oral communication at the National Gallery, confirming his opinion. The ground is chalk, confirmed by X-ray diffraction. Although not visible in the X-ray images, fibres could be seen in the ground in several samples and these seem to be sandwiched between two layers. The ground has been covered with a thin off-white or pale pinkish priming layer consisting of lead white and a little red lead. 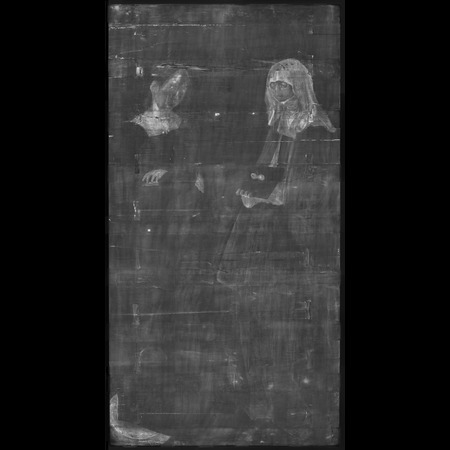 There is a free, linear underdrawing in a liquid medium, visible in infrared images of both panels. The presence of black backgrounds, other areas of black paint and of gold leaf means that not all of the underdrawing can be seen by infrared reflectography, but enough is made visible to give a good overall impression. The drawing consists of simple outlines and appears to be freehand, although the heads at least are probably based on the copying by eye of pattern drawings. There are many small changes between the underdrawing and the finished paintings. In Saint Genevieve’s face (NG 6511.1) the eyes are painted slightly lower than where they were underdrawn. The nose that was drawn was rounder, and the ear higher and wider than that finally painted. The eyebrows are indicated with a series of short parallel dashes. The edge of the hair and parting are drawn, and the plait is indicated very freely by a series of interlocking arcs. Similar lines are drawn under the paint of the puff of the sleeve at the shoulder and might indicate that her plait was planned to lie on her shoulder. Both hands were also underdrawn: the fingers of the hand at the top of the candle were painted higher than they were drawn. The outlining of the face of Saint Apollonia has a sketchy quality, and the lines around the eyes and nose are broken, as is the line round the profile. The chin was painted in a lower position than it was drawn. There are some random curving lines to indicate the hair. Slight changes are visible in the position of the arms and the fingers have been moved. 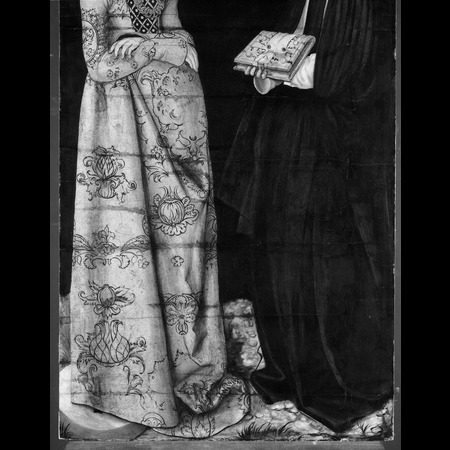 The skirt was drawn wider so that it touched the trailing skirt of Saint Genevieve. There are other lines visible at the bottom of the skirt which extend into the foreground. They have the same texture and quality as the rest of the drawing but their purpose is unclear. Saint Christina’s eyes (in NG6511.2) are drawn looking to the right, not directly at the viewer as painted. A large ear was drawn under the hair, but it was not painted. A line across the left hand at the position of the knuckles could either be an indication of the anatomy, or the position for the cuff of an inner sleeve that was not painted. There are small adjustments to the position of Saint Ottilia’s right eye, which was painted lower than it was drawn. There are parallel curved lines below the lower eyelids in the areas painted as shadow. The outlines of the saint’s veil are underdrawn and this guide was followed in painting. The folds of the headdress over her shoulder are sketched with considerable freedom, which was not always followed at the painting stage. The swags at the top of each panel; Saint Genevieve’s bodice, jewellery and the bands of brocade on her skirt; Saint Apollonia’s necklace; Christina’s robe; and Ottilia’s book are all mordant-gilded. The adhesive (mordant) for the gold leaf is brownish-yellow in colour and consists mainly of yellow earth, with a little lead white, red earth and verdigris. When this last pigment is found in mordants it is usually considered to be present as a drier, which implies an oil-based binder, although this has not been confirmed by analysis. The swags are modelled with black lines and a more translucent brownish paint. 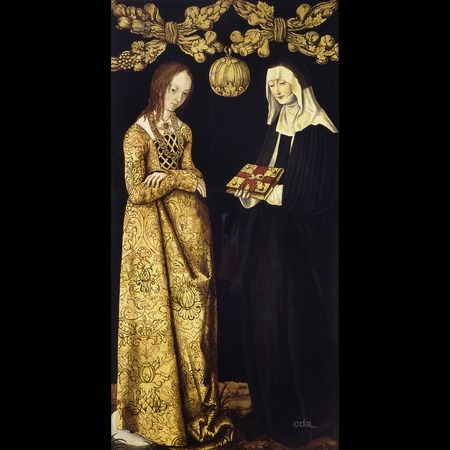 Similarly, on the gilded garments a translucent warm brown has been used to model the forms, for example the shadows under Christina’s arms and the folds in her skirt. This is in addition to the pattern on her robe in red lake and what appears to be black but is in fact darkened copper containing green. In contrast, the pattern on her bodice is intended to be black. There is no medium analysis. In the black background paint some verdigris has been mixed with the black pigment, probably as a dryer. The same mixture was used for the black pattern on Apollonia’s collar, applied on a pale orange layer composed of lead-tin yellow and red lead. In cross-section, this base colour is more strongly orange at the bottom of the layer and paler nearer the surface, suggesting that there may have been some lightening of the red lead pigment, and that the scarf may originally have been deeper in colour. The paint of her red dress is based on vermilion and red lake, mixed with some black in addition in the shadows. Genevieve’s candle and the haloes of all the saints are painted in lead-tin yellow. Red lake was used for the ribbons on Genevieve’s sleeves. The deep velvety purple of her underskirt is created with a base layer of black (again containing some verdigris as a drier), on to which deeper or lighter translucent pink mixtures of red lake mixed with varying amounts of lead white have been applied. Her bright green skirt is based on verdigris mixed with varying amounts of lead-tin yellow, as is the green of the grass in the foreground. Fibres in the ground, perhaps between layers of chalk. Thin priming layer, yellow mordant, gold leaf. S1. Black paint from pear, right edge, with drying cracks. Is this original? - Thin layer of lead white and some red lead – priming? Green glaze with some browning at the surface. A fibre is visible in the cross section of this sample. The unmounted fragment shows dispersed black particles on the ground layer beneath the paint. This could be underdrawing. One sample does not have the paint on top of the black. The black does not look like charcoal. - Chalk ground. Fibres which seem to be between layers of chalk. Cross section does not look like original paint. However, there is a further unmounted fragment which seems to consist of black paint with a green layer of verdigris on top – make new cross-section. Most of the old varnish and retouching were soluble in propan-2-ol and white spirit (1:1). The repairs in the gold were also mainly soluble in this mixture, and much of the yellow toning on the gold was soluble in a weaker mixture. Some older retouching, e. g. on the two faces, were very hard and were removed mechanically. Various different types of filling had been used to fill gaps round the butterfly keys and some of the wider splits in the panel; these putties were dug out where possible, and the remainder removed later on during panel work. It was felt that it would be imprudent to try remove all the old restoration from the gold decorations and from the robes. Some new repairs in gold powder were removed, but older, gold leaf repairs over losses or joins in the panel were left. The status of the toning over the gold was uncertain. Through highly soluble and in places covering new gold leaf, it was also, e. g. in the swags at the top, apparently modelled and complementary to the original black lines on the gold. The cradle was removed from the back of the panel. The six oak butterfly keys were replaced with balsa wood using Beva 371 as an adhesive. The panel separated into three sections as the cradle was removed. The numerous splits and open joins were manipulated and glued with a urea formaldehyde adhesive. Irregularities in the back of the panel were filled with a Paraloid B67 / sawdust cement. The back of the panel was built up with two layers of balsa wood planks and wax. The gilded parts of the surface were retouched with gold powder glazed with Ketone N. Paraloid B72 was used for the remainder of the retouching, and Ketone N as a preliminary and final varnish.